Warehouse Sale (March 19 - 26, 2016) 8 Consecutive Days!!! (March 19 - 26) 8 Consecutive Days!!! Once again we will be offering amazing deals as we open our warehouse to the general public. This year we are pleased to announced that we will be open for 8 consecutive days includingSunday, March 20! Cash, check, and all major credit cards are accepted and parking will be available at the warehouse and in front of the factory. Come in early for the best selection on Inventory over-runs, Dalle de Verre slab glass products and Antique Sheet Glass products. Limited availability on specialty colors and designs. Prices as marked. No additional discounts or coupons. Along with our Annual Warehouse Sale, our Spring Open House Event will also be held at our Visitor Center Store on Saturday, March 19. Visitors will be able to participate in classes (fees apply) and two new Limited Edition Items will go on sale Saturday, March 19 at 9am at the Visitor Center Store. (tickets will be passed out at the door). Each piece is limited and hand numbered. Limited 2 per style per person. Limited Edition Items can be seen below. Special Edition Bunnies will also be available while supplies last. Bunnies are not signed or numbered but quantities are limited, get yours while supplies last! Along with this, this year we are also offering a 15% Discount on everything in our gift shop, excluding Limited Edition, Special Edition Items & Customized Etched Items by Mindy. Discount valid ONLY during this event; 9am - 4pm and ONLY at Visitor's Center Store. 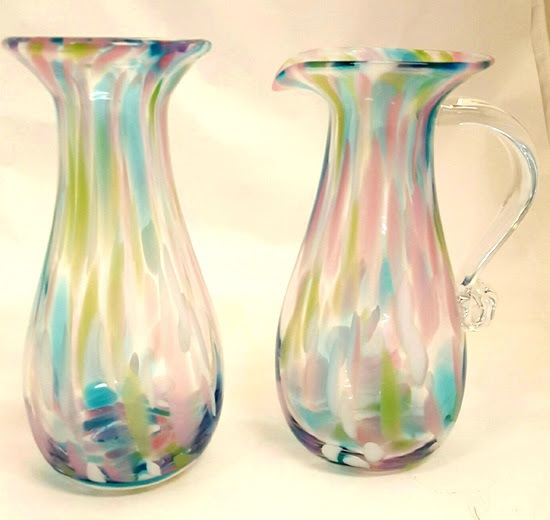 Pastel inclusions of Light Blue, Pink, Green & White coloration mix together to form these 2 breathtaking classics. Their muted and elongated colors are reminiscent of spring rain and the beautiful flowers that they are patterned after. Vase & Pitcher are approximately 10'' tall. 40 signed & numbered pieces will be available in both styles. "Hydrangea" Vase is $50 & "Hydrangea" Pitcher is $54. For our customers who can't visit us in person. We will be offering 40 of our Limited Edition "Hydrangea" Vases & Pitchers for online purchase Monday, March 21 at 12 noon Eastern time, 9am Pacific time at shop.blenko.com. Each piece is limited and hand numbered. Limit 2 per style per person. No phone orders will be accepted. Shipping charges will be calculated at the time of shipment. No special number requests will be taken, numbers will be assigned as orders are received. Just in time for the holiday and our Open House Event, our Easter Bunnies, Easter Eggs and Easter Baskets are sure to be a customer favorite this time of year. AvailableSaturday, March 19 at the gift shop. No two eggs or bunnies are exactly alike. Get yours while supplies last. 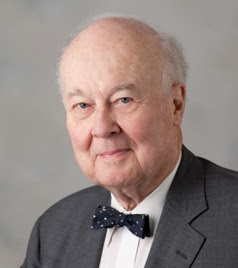 Walter Blenko Jr. will be attending our Spring Open House on Saturday, March 19 for a special signing event. Signing event times will be announced soon. Check back for information or like us on Facebook to receive the most up to date information. Here is a list of special factory events and dates. Back by popular demand we will have our Make Your Own Easter Egg class. 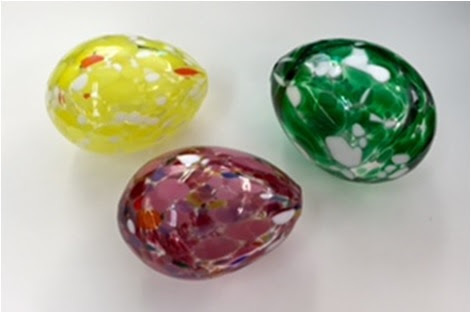 Each person will work with our craftsman to create two multi-colored glass Easter eggs. In this class each participant will learn the steps required to make a stained glass panel and will then create their own 8'' x 10'' panel. Sign-ups for classes begin today, February 26 and class space is extremely limited. Give us a call at 304-743-9081 if interested. Credit card required to hold reservation. We hope to see you soon!!! Blenko limited edition sale, starts 3/17/2014 at noon EST, 9 am PST. NEW Glass Chime: Ages 10-up. $45.00/person. Choose and assemble a beautiful glass wind chime that will sparkle in the sun and bring music to your life. NEW Glass Painting: Ages 3-up. $10.00/person. 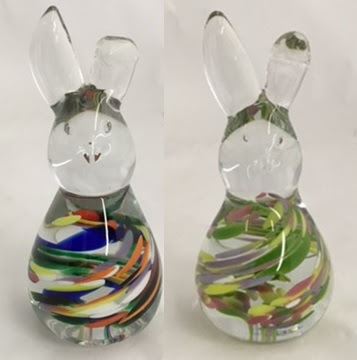 Choose between a small cast animal, glass blank or ornament and use your creative talents to decorate your piece of glass with endless colors and designs. There is no specific start or end time for participants in this class. NEW Stained Glass Mosaic Art: Ages 12-up. $85.00/person. Create a beautiful stained glass mosaic panel in a wooden form. You will have the opportunity to shape your glass, place your pieces and grout your design to create your colorful finished piece. Your finished work will be 14" in diameter including the wood frame. Blown Ornament: Ages 12-up. $35.00/person. Each Participant will choose from selected frit colors and with the assistance of Blenko Artisans create their own one of a kind round ornament. Stained Glass Panel: Ages 12-up. $85.00/person. 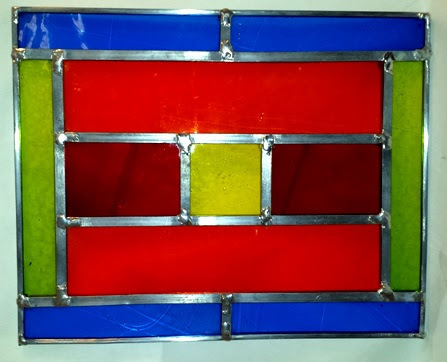 You will learn the steps required to make a stained glass panel and will then create your own 13" x 13" panel. Blown Glass Vase: Ages 14-up. $65.00/person. 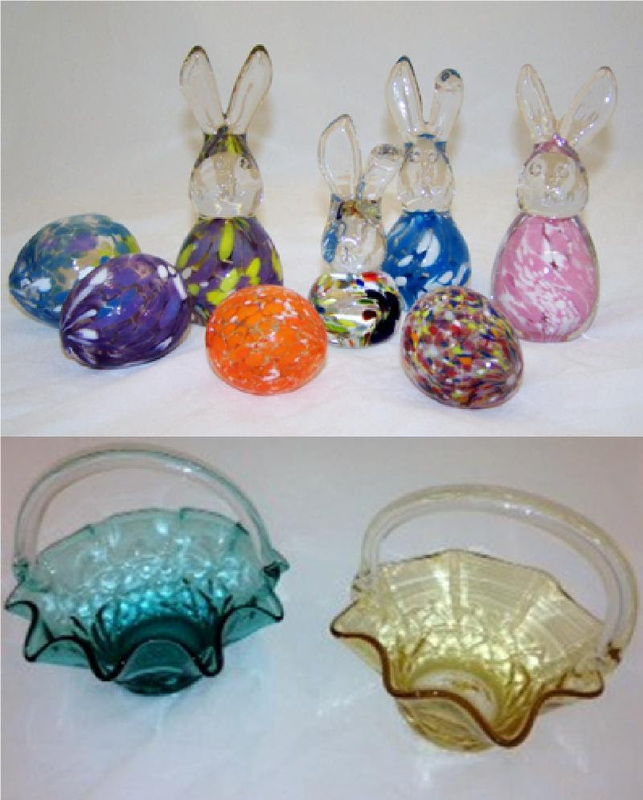 In this class each participant will get to roll their piece of glass in selected frit to pick up the desired colors. Then they will get to heat the piece up to melt the frit and blow their piece of glass into a wooden form so that it can be made into a vase or bowl with the finisher. November 28, 2013: Closed for Thanksgiving. November 29, 2013: Black friday sale starting at 8 am. December 25, 2013: Closed for Christmas. January 1, 2014: Closed for new years. Blenko festival of glass is on Aug 2-3, 2013. Below is the detailed schedule of events. Course descriptions are listed on www.blenkoglass.com also. See below from Blenko Glass. Call us at (877) 425-3656 with questions and to sign up. Class space is limited and will fill fast. To reserve your spot, payment must be secured by Visa, MasterCard, Discover or American Express at the time of reservation. Cash or Check payments must be received no later than Wednesday, July 31. Classes must be paid in full before the Festival. Any unpaid reservation will be cancelled and reopened to other customers. Credit card paymentswill be processed on Wednesday, July 31. For cash/check payments you may stop by the Main Office Mon-Fri 8am-2:30pm or mail check payments to Blenko Glass Co., P.O. Box 67, Milton, WV 25541. If you have any questions regarding payment, please contact Tammy McDonald at (877) 425-3656. Thank You. June 20th West Virginia will be 150 years old, and as always Blenko will be making a special WV birthday piece. Below are some words about it from the designer, Arlon Bayliss. Loving 150 years of West Virginia. Blenko has put their heart and soul into making a special commemorative piece to mark the 150thBirthday of West Virginia. We wanted this piece to be extra special. As I thought about a theme for this important Blenko Birthday piece, my mind kept returning to how West Virginians hold each other in their hearts; to their generosity, hard work and love. The priceless skills of our mold-makers and blowers have led to a remarkable commemorative piece that not only celebrates love, but is made with love too. Made of turquoise and crystal glass, to represent a mountaineer’s freedom, this eleven-inch tall, ballooning vase expands with billowing hearts from a narrow base to broad rounded shoulders, and a generous flared rim. Blenko “hearts” West Virginia, and West Virginia “hearts” Blenko! This is the big event for Blenko Glass collectors - a great weekend for parents and grandparents - its a well planned event. Classes for all ages, activities for the kids, bring a lunch or purchase food from vendors. Eat near the Blenko Glass Garden and pond. The cost of this weekend is minimal and depends upon the activities you choose. Many unique glass items are being made for this event. In years past - each shop made onre or two limited edition items to be sold. . . . Return here or /& check out http://www.blenkoglass.com/ for additional information. The new blenkp project website is under construction.